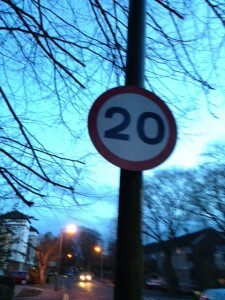 Since we were elected as Councillors for Sutton South Ward we have been concerned about speeding in the Ward. Following the speeding survey we promoted in 2011 new traffic islands in Cavendish Road have had an impact on the speed of vehicles using the road. The new zebra crossing with the re-distribution of parking bays along the road – so there is more parking along the road, which generally does slow the speed of traffic – in Cedar Road (between Brighton Road and Langley Park Road) has had some impact on speeds there. We have also sought to deal with the specific problem of the speed of vehicles approaching the right turn from The Ridgway into Chalgrove Road with better signage on the road and on lamp-posts as your approach the bend. A proposal now under consideration and discussed by the local committee on May 25 concerns the area of the Ward west of Brighton Road. If fully implemented this would introduce a 20 mile per hour limit in the area east of Overton Road (including Overton Road) as far as the Sutton to Belmont railway line, so including these parts of Worcester Road, Grange Road, Camborne Road and Stanley Road. There would be signage to indicate the speed limit and some raised junctions, and road humps, where roads crossed. This follows a speeding survey indicating some vehicles travel too fast along these roads. There will, of course, be extensive consultation with residents before such a proposal is implemented and, given current funding restrictions and other priorities, action on this proposal – which is a proposal for Transport for London funding – cannot be guaranteed even if supported in consultation. We would welcome any reactions, particularly from residents who live in the area. We have also previously floated, in the list of bids to Transport for London, consultation of residents on the inclusion of Christchurch Park in the Sutton South 20mph speed limit area.